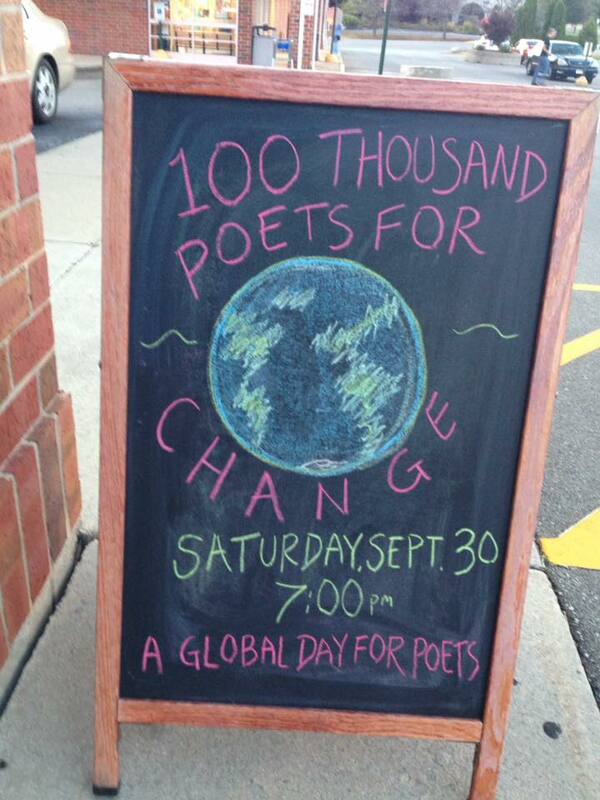 Last Saturday I had the chance to participate in an event titled 100 Thousand Poets for Change. It was held at Books and Company in Oconomowoc, a store that has among its offering my book, Dirty Shirt. I was asked to be part of it by a poet friend, Cristina Norcross, founding editor of the online poetry journal, Blue Heron Review. I have long been a fan of her work, and in the past year have seen her at a handful of events. Anyway, the event was not just local. It was billed as an international event with locations in a bunch of different countries. Knowing that it was happening on the same day across the world was pretty cool. A local musician Jacqueline Nicholson warmed up the event and as a side benefit, donations were accepted and put toward money to buy children's books for the Oconomowoc Public Library. Because...kids and books! It was a win-win. The theme for the event was poetry centered around world peace, social justice, environmentalism and healing. People were invited to bring up to three poems focused on any of those four issues. I brought two, one on the environmentalism theme titled, Looking for Muir, which is from my book Written Life. The piece documents a fishing trip I took to a southeastern Wisconsin suburban lake one morning. The second poem, Reciting From Memory, by the ebook of the same name was centered around the handful of memories I have about my dad and spoke to the healing theme. I know this gig is not for everybody, but I can't say enough how hearing the work from the other poets moved me. People read work about a better, more peaceful, sustainable world. They talked about pain and change and beauty. They pleaded for social justice in an unjust world. And in a moment of reverence, a couple of poets even paid tribute to Susan Elbe, a well respected local poet who passed away two days prior to the event. As I was sitting there I was wondering what, if any effect this event could have in the world. Then one poet reminded me that to change the world, we have to change ourselves. And along those lines, it was one of those moments that you sit and reflect, and listen and most of all ignore your phone and your problems for an hour and a half. There is a peace in that. And as Cristina said, maybe the energy of the evening will go out into the world and change it in some way. I can't argue with that, given all the pockets of negative energy in this day and age. Maybe it all adds up somewhere. We gotta keep trying anyway. What a thoughtful thank you for the evening. There was such variety in the poems, and yet they all added up to Caring About our World, Caring about Justice, and the Environment, Caring to make it better. It felt good to leave there having come out on a Saturday night to do something positive.